Caboolture is it time to declutter, save time, downsize and live your life? Stop robbing yourself of precious time with family, friends, children, adding layers of stress that cost time and money? 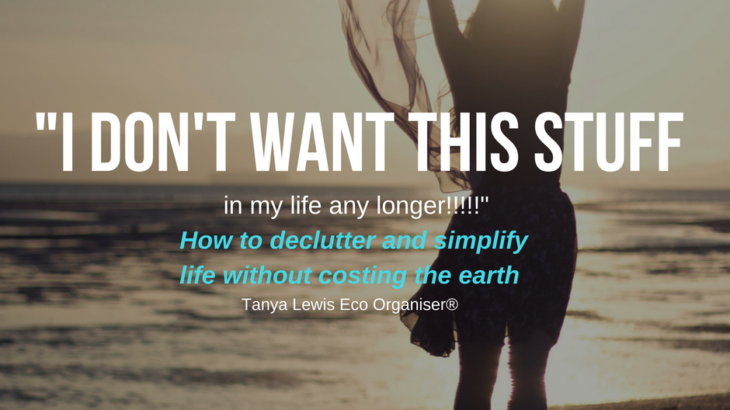 Join Tanya Lewis The Eco Organiser® at this workshop and learn how to ethically declutter, how to identify your clutter, how to downsize and live your life, without costing the earth! Decrease your stress levels, clear your mind and save valuable time and money by learning strategies to better organise and manage your household clutter. With the average Victorian household throwing out $2,200 worth of food each year – that’s $42 per week! One fifth or 20% of the yearly grocery budget is wasted on average. That’s like throwing out 1 in every 5 bags of food you buy! And $700 million worth of leftovers are throw our per year – that’s enough to buy laptops for 580,000 school children. Join professional Eco Organiser® and author Tanya Lewis as she returns to share her tips on how to declutter your kitchen and reduce food waste for this workshop on Tuesday 10 April. Bookings are essential as places are limited. To register, please contact Council on 8571 1702. Tanya Lewis is a professional Eco Organiser® with an uncomplicated philosophy, borrowed from Gandhi. And she is on a mission to divert waste from landfill and turn clutter into opportunities. Eco Organiser® blends traditional organising aims of creating order in our time and space, with an absolute passion for closing the loop. From the bush to the boardrooms of Australia her educational tool The 10R’s™has been taught to over 5000+ people. Sharing her knowledge and expertise on how to declutter and simplify life, without costing the earth. Founder of Eco Organiser® author of STUFF OFF! Suffocated by clutter? Practical tips that won’t cost the earth to rid your life of clutter, Sustainable Interior Designer, Organising Coach, blogger and visionary believes that being organised won’t cost the earth. ” I HAVE TO BE RUTHLESS, AND REMEMBER I DON’T WANT TO HAVE THIS ANNOYING STUFF IN MY LIFE ANY LONGER!!! Tanya your words come to me at the perfect time. I appreciate what you had shared in our on line coaching sessions. Keep powering on in helping people get their power back! POP UP up at Malahang Community Festival in Heidelberg West, talking all things waste, decluttering and much more. Malahang Community Festival is a free and family-friendly event celebrating your local community. It’s a safe, fun and exciting day for the whole family with music, games, competitions, stalls, food and information. Join thousands of others who come to celebrate a day long festival, accessible to people from all walks of life. Malahang Community Festival is a fantastic opportunity for local artists, community groups, traders and other organisations to be seen and heard as well as meet and interact with the local community. 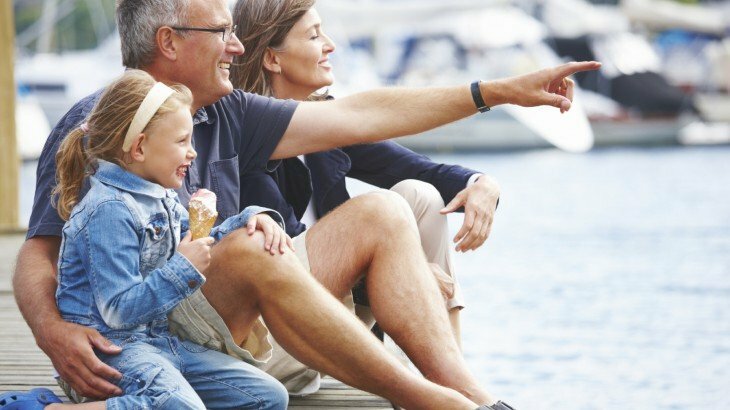 Bring along a picnic or grab a sausage for a gold coin from the Community BBQ and sit back and enjoy the entertainment or get involved in some of the awesome activities. It will be huge 3000- 5000 people! 3 x 20 minute presentations doing speed decluttering. What does clutter cost the planet? Join us for this fun workshop to help your declutter and simplify life without costing the Earth. Because life really is too short to be looking for STUFF! 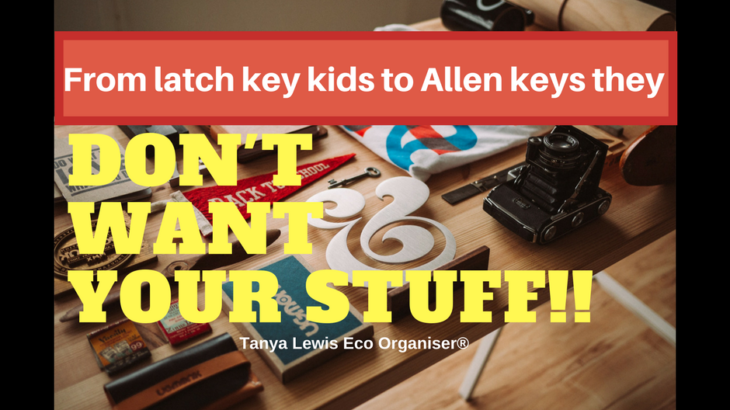 From latch key kids to Allan key kids, they don’t want your STUFF! Let’s be honest here, why should they want your stuff, it is not embedded in their DNA that they are going to follow the same fashions as you do. I know that may seem tough, but it is true. Personally, I love the pieces from my family, they carry stories which fill in the blanks or give me a greater appreciate for how they worked hard to make or purchase these things. How to get over the disappointment that nobody wants your STUFF! We work hard to create our ideal home and life, and throughout the years we accumulate stuff that falls into 3 categories the good, bad and the downright ugly. Things in our homes often reflect the life we had or wished to had, but what happens when it is time to rethink life, to downsize either by choice or not, and all of a sudden you find out nobody wants your stuff!! We go through a range of feelings- hurt, embarrassed, angry, confused, deflated, bruised ego, to overwhelmed with fear of what to do with this STUFF! Dandenong do you have time to waste looking for your things? How much time do you waste looking for the keys, phone, purse just to get out the door on time? Do you struggle to find a little ME time or are you always busy doing STUFF? Finally there is more time to do the things you want. What would you do with more time in your day? Join us at this fun interactive workshop and learn how to declutter and simplify life. 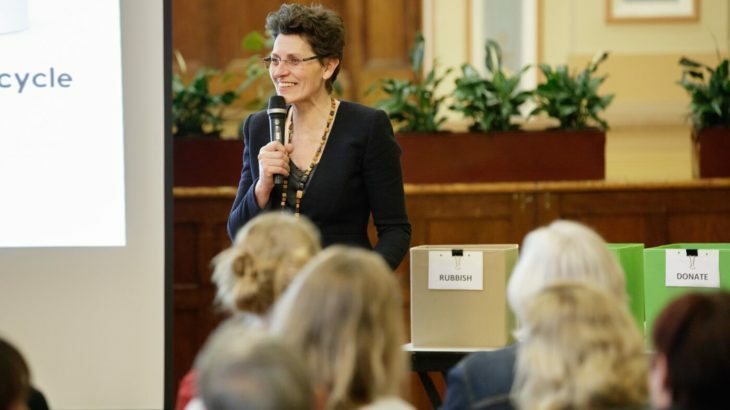 Presenter-Tanya Lewis Professional Eco Organiser®, Keynote Speakers, Author of STUFF OFF! Organising Coach, Blogger, Interior Designer and visionary believes that being organised won’t cost the earth Pre Order your signed copy of STUFF OFF! Do you have and happy home, or do you waste time to looking for your things,which rob you of precious time with your family? Do you struggle to pay bills on time, because you are drowning in a sea of paper? Do you struggle to find family time or a little ME time or are you always busy doing STUFF? Finally there is more time to do the things you want and be with the people you love. Small business owners are expert jugglers with running a business, the household and caring for others. But… How would you feel if every room in your house was organised, making it easy to find things? “A place for everything and everything in it’s place” sound too good to be true? Hold onto your hat, this is going to shock you!! We don’t always need to declutter, sometimes we just need to sort and organise!!!! 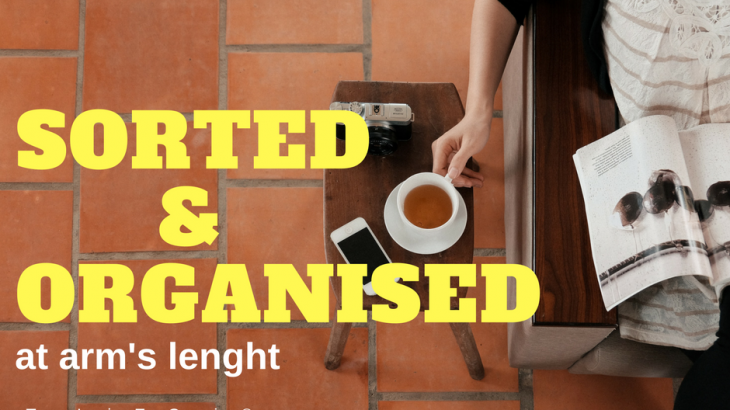 Some of you will breathe a sigh of relief, the role of a Professional Organiser not to throw STUFF out, it is to help you simplify life, making it easy to find what you want when you want it. Subscribe to our newsletter to download our ‘Top 7 Tips to Declutter Your Home’ e-Book for FREE. Also keep up to date with our latest news & events. Greenpeace: True Food Guide Thank you from Greenpeace.